NIGHTLIFE in TOKYO, JAPAN around SHINJUKU (新宿区)! Come join us for nightlife in Tokyo, Japan as we visit the vibrant area of Shinjuku (新宿区) where you find a plethora of tall buildings, neon lights, restaurants, bars, karaoke rooms, arcades and more! Our night kicked off with us just wandering around the busiest sections of Shinjuku marvelling at all the lights, crowds and action. We spotted the Robot Restaurant which is one of the more popular tourist attractions in Tokyo especially for tourists. Although we didn’t go there we wandered around further until we hit up Golden Gai – a section of small alleys with Izakaya (small bar/restaurant). It would have been fun to have a drink there but we couldn’t film so we ended up finding a more rowdy place a few streets over where we drank beer and ate Takoyaki. After the food and drinks we decided to go check out an arcade where drumming and Mario Kart consumed our attention for a while. 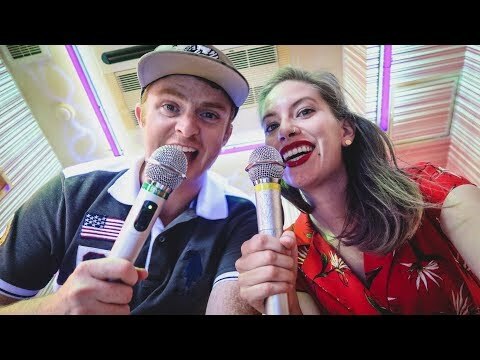 Our stop for nightlife in Tokyo was at a karaoke where we enjoyed singing and didn’t enjoy the two worst adult beverages of our lives. Overall it was a great evening of nightlife in Tokyo and we especially enjoyed getting to see Shinjuku at night having spent quite a bit of time in that area by day. We are here in Tokyo and it as night and that can only mean one thing. Nightlife! We are here in Shinjuku (新宿区) to experience the nightlife. This is an area that is known for its nightlife. It is full of bars and clubs and discos. It is a Friday night we finally decided we need to get out. We’re going to show you what Tokyo nightlife is all about. First impressions here. So far lots of flashing lights. There is a lot of music and down some streets with bouncers trying to lure you into their restaurant or their bar. I assumed this would be an area where you see lots of young people and also lots of foreigners. I’m also seeing a lot of like men in business suits and people who look like they’ve just left work on a Friday ready to blow off some steam. Our quest for food has brought us over to Golden Gai (新宿ゴールデン街). Well it is completely different from the area where we were just visiting. Which is like neon central and big pedestrian walkways. This is much smaller. So you’ve got tiny little alleyways. And you’ve also got these really intimate Izakayas (居酒屋). Which is basically these tiny little bars and there is only a few stools in each of them. we found kind of rowdy little bars slash Izakaya (居酒屋) and they had a free table and we’ve been walking around for a while so we’re like yeah let’s go in there. So we ordered two ice cold beers. Ice cold beers! Cheers! And we’ve got Takoyaki (たこ焼き) coming. I have to say the nightlife here in Shinjuku (新宿区), after like wandering around for a little while, popping into some bars and having some drinks. It is an absolute assault on your senses. We’ve got so many things vying for your attention. You have those neon lights, you have people trying to lure you into their bars. You have just the sheer crowds. It is absolute madness but I kind of love it. Where are we now? Alright guys this is my idea of a fun night out in Tokyo at an arcade. Mine too. next up the plan is Karaoke. We had to go to like 3 different places to find one that has availability on a Friday night at a reasonable price. At a reasonable price. that concludes our tour of nightlife here in Tokyo. Yeah. Particularly, Shinjuku (新宿区). Hope you guys enjoyed it. It has been a long night. It has been a long night. We don’t do this very often but it sure was a lot of fun. We did a lot of different things. I think our favorite thing maybe was just walking around and just seeing what it is all about. Soaking it all in. All Of The 10’s From 2018! The BEST Street Food from Around the WORLD!